Star Wars Pizza - Crossguard Lightsaber Pull-Apart Pizza! Star Wars Pizza – Crossguard Lightsaber Pull-Apart Pizza! 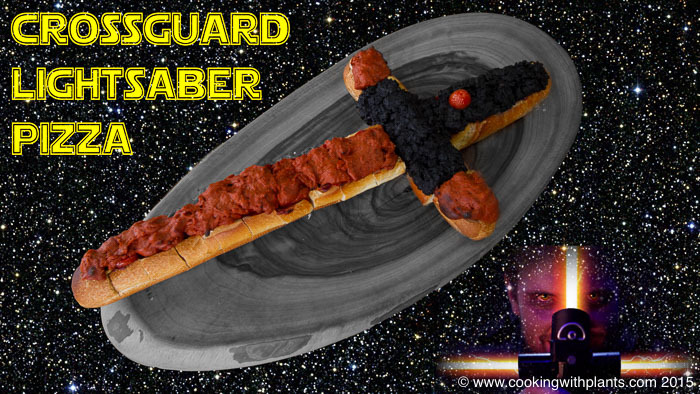 Home/Star Wars Pizza – Crossguard Lightsaber Pull-Apart Pizza! This STAR WARS Crossguard Lightsaber Pull-Apart Pizza is a perfect party food for kids and adults alike! Add all of the Red Stretchy "Vegan Cheese" Ingredients into a blender, and blend till smooth. Place your mixture into a pan (I used a non-stick fry pan), turn on the heat to medium-high and stir constantly until it becomes thick and stretchy. (See video at top of this recipe page for full cooking demonstration). Take pan off heat and place mixture in a bowl and set aside. Add all of the Black Stretchy "Vegan Cheese" Ingredients into a blender, and blend till smooth. Place your mixture into a pan (I used a non-stick fry pan), turn on the heat to medium-high and stir constantly until it becomes thick and stretchy. Cut a small straight section off the bottom of the baguettes so that they sit flat. (See video at top of this recipe page for full cutting demonstration). Cut a small amount off the top of the baguette so that it is flat and ready to hold your pizza toppings. Cut the first piece of baguette to a length that sits diagonally on a baking tray (keep it as long as possible as this will be the main section of the lightsaber). Next cut the ends off the second piece of baguette about 10cm / 4 inches. These will form the "light" sections of the crossguard. Cut a piece of baguette off your second bread stick that is about 20cm / 8 inches wide. This will form the main crossguard section. Cut into pull apart sections (3/4 way through). Assemble as per the video instructions at the top of this page. Bake in oven at 180C / 360F for approx 12 minutes. Remove from oven and carefully move onto a chopping board or serving platter and eat up!!! * You can get black tahini from my Amazon affiliate link at: http://bit.ly/black-tahini OR at most Asian grocery stores and health food stores.